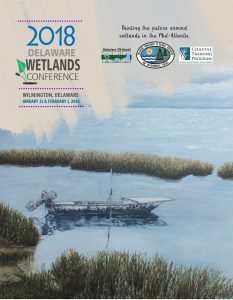 The cover for the 2018 Delaware Wetlands Conference, by artist Teri Edgeworth, who won the 2017 conference art contest. DOVER – Registration closes Wednesday, Jan. 24 for the 2018 Delaware Wetlands Conference, so those who have not yet registered are encouraged to do so now. Organized by DNREC’s Division of Watershed Stewardship, the conference will be held Wednesday, Jan. 31 and Thursday, Feb. 1 at the Chase Center on the Riverfront in Wilmington. Online registration and information about the event, including sponsorships, can be found at http://de.gov/dewetlandsconference. DNREC’s Wetland Monitoring and Assessment Program and the Delaware Coastal Training Program have planned a two-day event that showcases the importance of wetlands. Each day includes invited speakers, poster sessions, networking time, lunches and a total of 62 presentations that cover wetland restoration, climate change, mapping, education and outreach, planning and conservation and plants and animals. Featured speakers include Dr. Lenore Tedesco from The Wetlands Institute, who will address resiliency-driven coastal wetland restorations, and special guests Governor John Carney and DNREC Secretary Shawn M. Garvin. For more information on the 2018 Delaware Wetlands Conference, including the agenda, please visit Delaware Wetlands Conference, or contact Brittany Haywood at Brittany.Haywood@delaware.gov, or 302-739-9939.